We love the idea of a perfectly tidy bedroom with plenty of bedroom storage: Marie Kondo’s The Life-Changing Magic Of Tidying Up sold over four million copies worldwide, with readers everywhere dreaming of de-cluttering and organising their homes. But the reality of our daily life is often very different. Getting dressed in the half-dark every morning is tricky enough, without having to locate your only clean/ironed blouse in a chaotic heap of clothes. And with more of us than ever living in small spaces, a SATC-style walk-in-wardrobe is, for many, the stuff of fantasy. Despair not, though. Whether your home is a rented studio flat or a cute-but-cramped cottage, you can still have that Pinterest-worthy wardrobe with our comprehensive guide to clothes storage ideas, from fitted options to storage units and kids' room storage ideas. If you are working with a small bedroom and you’re tight on storage space, make use of every spare nook and cranny. The gap above your bedroom door is ideal for squeezing in a few more shelves for hats, handbags, or even bathroom linens. Handmade in Cue & Co of London’s workshop, this clever fitted storage combination would work in any home with a reasonably high ceiling. Your walls are valuable storage space. Pegs and clothes storage racks are perfect for storing grabbable items like scarves, hats and bags. 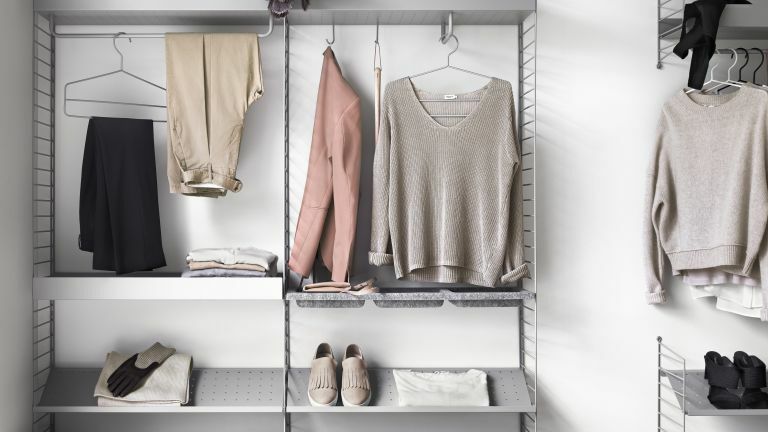 The sleek Scandi Garment Rail from John Lewis is both practical and stylish. Children’s rooms are especially mess-prone, so any furniture item that serves two or three purposes is a winner. A stool that doubles as a side table with room inside to stash clutter is a must - and the design is adorable. The Storie stool from Olli Ella works equally well as kids' clothing storage or kids' book storage. It doubles up as a seat, too. Discover more children's storage furniture ideas. We’ve covered walls and doorframes, but what about your ceilings? Hanging rails are ideal for storing clothes when wall space is limited. Meet all your clothes storage hanger needs at Rack Buddy. The old basket at the end of the bed: a classic. And for good reason – a traditional wicker basket is just the thing for storing pyjamas, bedsheets and towels. Find more clothes' storage containers in our buyer's guide. A range of good-looking storage baskets is available from The White Company. Plenty of beds come with storage now, so why would you have one without? In bedrooms lacking storage space, those storage beds or storage headboards with those extra drawers are very handy for keeping socks, tights, pjs and that spare dressing gown out of sight. It also means you can avoid the need for clothes storage plastic drawers or under-bed clothes storage boxes. A selection of storage beds is available at Willow & Hall. While open wardrobes are convenient, they can look messy. A nifty and affordable fix is a curtain. Easier to open than a sliding wardrobe door, a curtain conceals unsightly mismatched clothes hangers, gym bags and any other items you don't want on display. Find more walk-in wardrobe and dressing room ideas in our guide. Find more clothes-storing inspiration at Ikea. Opt for a flexible clothes storage system that you can adapt according to your needs, by adding hooks and rails as required. Metal is considerably more flexible than wood. The String Shelving System is perfect for contemporary bedrooms and is available at Skandium. Sunglasses, jewellery and other accessories often get jumbled up and forgotten about – keep all these items together in a brightly-coloured suitcase that you can keep on top of your wardrobe. Find more dedicated jewellery storage ideas that will do for all sorts of small accessories. Find storage solutions for all your trinkets at Habitat. An imaginative and super-attractive storage aid: the humble branch. A beautiful rail made from birch is a lovely way to display your prettiest tops. Make your own or get a ready-made birch rail at Etsy. To take the storage potential of a bed further than the bed-and-drawer combo, why not invest in a bed with sneakily disguised storage. Not only is side storage great for spare bed linen, but it could also be the ideals space for storing valuables. The Vienna Side Ottoman Bed from Hyder Living is luxurious as well as practical. A simple garment rail is hard to beat. Light, portable, and easy to fit into the corner of a room, it's also perfect for carting out when guests need to hang their coats somewhere. The Garment Rack from West Elm is convenient and stylish, and will add a touch of Scandi chic to your bedroom. If there’s any part of your home in which to embrace playful storage, it’s the kid’s bedroom. Have fun with alternatives to baskets, such as storage jars and clothes storage bins. This kind of container can make great clothes storage for babies – use it to put away small miscellaneous items like bibs, booties, hats and scratch mitts. The Round Metal Storage Bin from Cuckooland can multi-task: use it as clothes storage or toy storage. Pegboard is a useful material in any room. Fixed to your wardrobe door, it’s handy for jewellery, shoes, glasses and bags. Wall clothes storage options are available at Ikea. Accessible clothes storage containers make clearing up your kid’s room (relatively) fast and easy. These coordinating clothes storage bags and laundry bins from H&M will come in useful for anything from toys to dirty laundry. Give your clothes and accessories special treatment by showing them off in beautifully-lit glass cabinets. Smallbone of Devizes have some beautiful examples of bespoke cabinetry from real homes, such as this stunning dressing room. Throw those bedspreads, cushions and non-seasonal bedding into an ottoman, which will fit snugly at the foot of the bed. While an obvious place for linens, ottomans are equally useful for stashing away belts, weekend bags and shoes. The Blanket Box from Angel & Boho is roomy and gorgeous. Sometimes you can’t beat a good old-fashioned wardrobe. Opt for one with a drawer at the bottom and shelf at the top for foldable items or added storage baskets. Find classic wardrobes ideal for all bedrooms, including kids' bedrooms, at Cuckooland. Save yourself precious space by sleeping bunk-style, with the lower half of your bed cleverly utilised as a wardrobe, complete with rail and hanging drawers. Find the best kids' bunk beds and the best kids' beds (including one that looks like a treehouse) in our buyer's guides. Shop Ikea for clever bed-storage-combos. Keep it simple with a 50s-style streamlined chest, which will happily accommodate your folded sweaters, shirts, trousers and pjs. The Mid-century 5 Drawer Chest of Drawers from West Elm is perfect for squeezing into a tight corner.